Track customer interactions wherever you are, and from virtually any device by using folder tracking. After you set up a tracked folder, you can drag or move email to that folder to track it automatically in Dynamics 365 for Customer Engagement. Additionally, if you set a regarding record (such as a specific account or opportunity record) for the folder, Customer Engagement automatically links all email in that folder to that specific record. Tracked folders work in Dynamics 365 for Outlook, Exchange Online, Outlook on the web, or any other mobile app that supports Exchange. This feature was introduced in Dynamics CRM Online 2015 Update 1 and CRM 2016 (on-premises). In the web app: On the nav bar, click Options . In Dynamics 365 for Outlook: Click File > Customer Engagement > Options. In the Set Personal Options dialog box, click the Email tab, and then under Select the email messages to track in Dynamics 365 for Customer Engagement, click Configure Folder Tracking Rules. If you want to link the folder to a specific record—for example, an account or opportunity—under Regarding Record in Dynamics 365 for Customer Engagement apps, click the Lookup button , and then search for the record. Make sure to take advantage of folder tracking on your mobile devices. 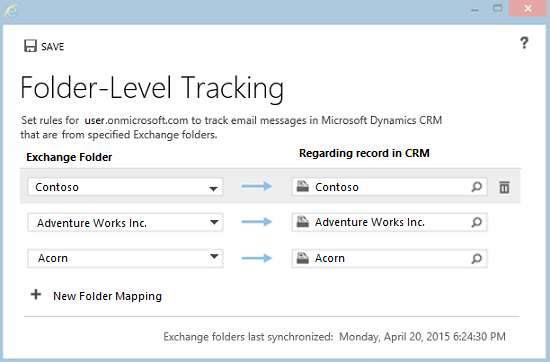 If your device supports Exchange email, folder tracking will work automatically. You don’t need to install anything. Just drag or move email to a tracked folder to automatically track that email in Customer Engagement. If you receive a small volume of email from many different customers, you may want to create a single folder called “Track in Dynamics 365 for Customer Engagement apps” (or similar name) that isn’t linked to a particular record. 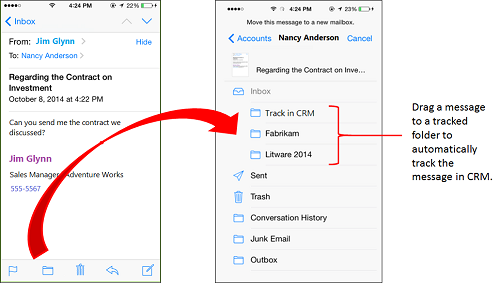 That way, you can drag messages to that folder to track them automatically. If you later want to link an email message in that folder to a specific Customer Engagement record, open that activity record in Customer Engagement, and then fill in the Regarding field. Delete a folder from Outlook or Exchange All email messages included in that folder will be deleted from Outlook or Exchange Online. Email messages already tracked through that folder will not be deleted from Microsoft Dynamics 365 for Customer Engagement apps, however. Want to see folder tracking in action? This demo puts it all together for you. A big part of working in Dynamics 365 for Customer Engagement is creating and recording different types of activities that revolve around a sales or service process, such as sending emails, creating opportunities, and assigning tasks. If you want to associate an activity with a more specific record and opportunity for example, you can set the regarding record for that activity. By using folder-level tracking, you can easily track and set the regarding record for an email by dragging or moving it into an Exchange folder. Let's take a look at a scenario with folder-level tracking. Nancy, a dedicated sales rep, finds and qualifies leads. Nancy has just started to work on a new opportunity called Northwind Traders. She wants to track and associate all the emails that relate to this opportunity. First, Nancy needs to create a folder in Exchange. She already has folders for her current accounts and opportunities, so she simply creates a new folder under the Opportunities folder. Then she needs to map the Exchange folder she has just created to Customer Engagement. Nancy clicks Options, and clicks the Email tab. She clicks Configure and creates a new mapping between the Exchange folder and the requested Customer Engagement record ‒ Northwind Traders in our example. Now, whenever Nancy gets an email that relates to Northwind Traders, she can simply drag and drop the email into the folder she created. The new email will be associated to the Northwind Traders opportunity within Customer Engagement. Also, Nancy can track emails while she's on the go by using her mobile device. She can simply move the email to the Northwind Traders folder using her native email application. Finally, since Morgan is the main contact person in Northwind Traders, all the emails from him relate to this opportunity. Instead of manually copying the emails from Morgan, Nancy can create an Exchange rule that will automatically copy all the emails that Morgan sends to the Northwind Traders' folder. By doing so, the emails will be automatically tracked in Customer Engagement and will be associated to the Northwind Traders opportunity. Folder-level tracking allows you to easily track and associate emails to Customer Engagement, manually from any device, or automatically by setting Exchange rules.